The musical path of saxophonist George Brooks is a serpentine one to say the least. He has always seemed to be attracted to slightly out of the mainstream artists such as the pianist Jaki Byard, the iconoclast saxophonist Jimmy Guiffre and trombonist Slide Hampton. He has studied with George Russell, played in orchestras led by Gunther Schuller and collaborated with the minimalist composer/pianist Terry Riley. Sometime back in the 1980’s he took two extended trips to India and there he became captivated by the music of this ancient land. He studied with and befriended master Indian vocalist Pandit Pran Nath, a friendship that lasted until the master’s death in 1996. With a thorough understanding of India’s raga style he has played with many important Indian musicians both here and abroad. 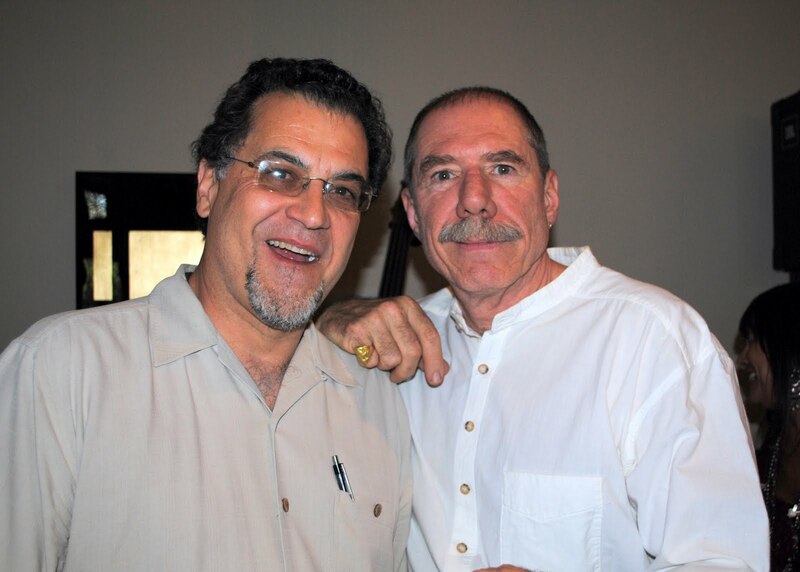 His association with master fusion drummer and one time member of the rock group Journey, Steve Smith, led him to form his Raga Bop Trio with Smith and Indian electric guitarist Prasanna. His work with tabla master Zakir Hussain led him to be a featured artist on John McLauglin’s "Floating Point " album in 2008. On Spirit And Spice , Brooks has written and performed an interesting, sonically rich and rhythmically alive collection of music that successfully integrates two distinct musical forms, creating an alluring hybrid having its own distinct appeal. From the opening salvo “Monsoon Blues” you get hit with a high-powered funk driven song. Electric bassist Kai Eckhardt’s keeps the groove in front of the syncopated beat of Steve Smith and the honky tenor saxophone of Brooks. Brooks has some Maceo Parker soul/funk going on here, perhaps a nod to his early days backing blues artists like Etta James and Motown favorites like The Temptations. Toward the end the group adds some curried spicing to the tune by introducing a section with Indian multi-percussionist and vocalist Sridar Parthasarathy that turns this into a ragified funk, undoubtedly unlike anything you’ve heard before. On “Spice” Brooks introduces a classical piano sound played by Frank Martin to the mystical bowing of Indian violinist Kala Ramnath and the twangy sitar sounds of Nildadri Kumar along with his own tenor, creating an exotic blend that carries you into the mysterious world of the bazzar. Brilliant interplay by Fareed Haque on guitar and Swapan Chaudhuri on tabla along with Smith’s amazingly empathetic drumming completes this journey into the depths of this far away land of antiquity and intrigue. “Silent Prayer-Madhuvanti” is a seductive melody that Brooks plays with a clean, affirmation of someone who is comfortable in his own skin. Brooks work with Haque is crisp and synchronous as the two play in front of Smith’s ever increasingly driven back beat. The most approachable song on the album is the forceful “Spirit”. Brooks plays the repeating melody line with a bright, forthright attack on tenor. Breaking the tension created by Brooks' high-powered introduction, Haque softly introduces a repeating guitar riff, accompanied by Martin on piano. The song reminds me a bit of Weather Report, sans the electronics, as it builds on a heavily driving beat laid down unerringly by Smith with Haque guitar and Martin’s accompanying piano chords. inspired, almost Gato Barberi type sound on this number. Combined with the rain forest flute-like sounds of the bansuri makes this song an unusual cross-cultural delight. A few short bars from Santana’s “Black Magic Woman” at the coda emphasize the Latin influence. 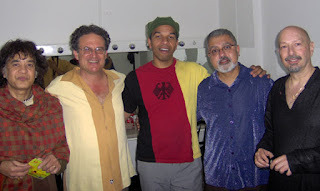 “Sri Rollins” has a Calypso-like beat that pays homage to Sonny Rollins work on his classic Caribbean inspired “St. Thomas” . Brooks has absorbed many styles into his repertoire and here he shows just one more facet to his saxophone personality. Haque similarly does some nice guitar work ala Jim Hall. “Pehkar for Hamza” is my favorite cut on the album, as it creates an air of spirituality and searching that is very moving to behold. Here the great tabla player Zakir Hussain’s wonderful and magical percussive skills are the perfect backdrop for the musings of Kumar’s poignant sitar and Brooks mellifluous saxophone. Hussain’s finger technique is amazing and Smith undoubtedly finds it invigorating to play drums along with such a kinetic percussionist. I suggest closing your eyes, turning up the stereo or donning the headphones and just listen to this wonderfully evocative piece of music. “Casting” is the last song on the album and the only song that finds Brooks on soprano saxophone. This is perhaps the most new age sounding song on the record. A smooth melodious tune that is very easy listening and pleasant, but after the mesmerizing effect of the aforementioned “Pehkar for Hamza” somewhat of a let down for me as a finale. All in all this is a fine, well-played album that successfully bridges the gap between Indian music and jazz in a way not heard since John McLaughlin’s Shakti . With his Summit group George Brooks may have found the perfect formula for melding mysticism with modernity. Friends of Santa Fe Jazz is an organization, since its inception in 2006, dedicated to preserving and supporting live jazz in Santa Fe, New Mexico.. 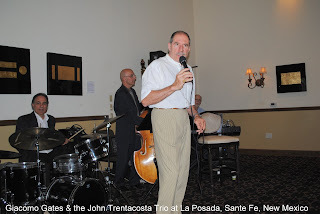 Billed as "a group of jazz soul mates" and co-chaired by one time President of the prestigious Berklee School of Music, Lee Berk and his wife Susan, the non-profit group organizes and presents top- notch jazz entertainment in intimate venues around the Santa Fe area. 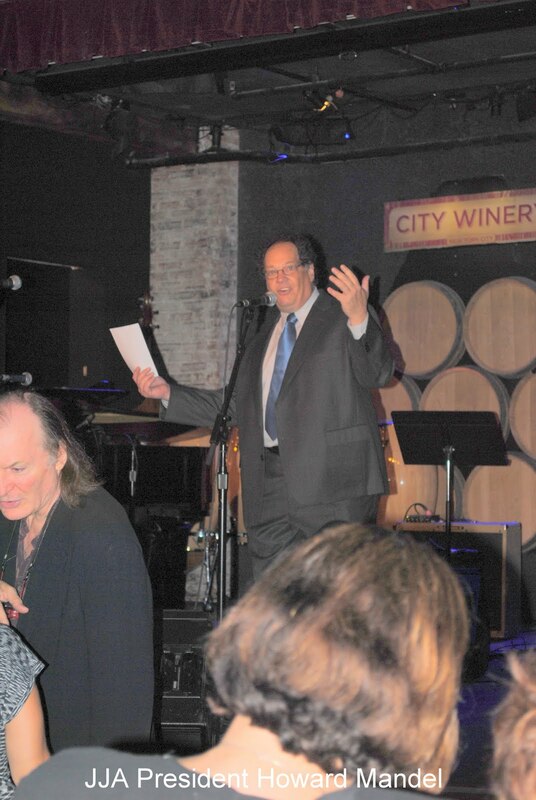 By sheer coincidence, or shall I say synchronicity, I was at the Jazz Journalist Association yearly awards last week in New York City and had the privilege of sitting with several musicians and singers who were up for award consideration. One of these happened to be the fine singer Giacomo Gates who had been nominated as "Best Male Vocalist of the Year" by my fellow members of the JJA. While we were enjoying the proceedings, which included many fine performances by some notables like the Marc Cary Focus Trio, The Tia Fuller Quartet and the Bobby Sanabria Big Band, I asked Giacomo where he would be gigging next. Much to my surprise he told me that he would be playing in Santa Fe, New Mexico next week for the Friends of Santa Fe Jazz. As life would have it, I too would be in Santa Fe that weekend and so I told him I would make the effort to get to see him perform there. 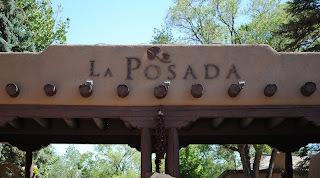 On a perfectly sunny Santa Fe afternoon, Giacomo Gates was performing in a splendidly outfitted open-aired banquet hall of the La Posada Inn and Spa. The room seated approximately one hundred and twenty patrons at twelve tables. The mostly middle-aged crowd came for an afternoon of jazz and brunch, with the music being provided by the beguiling Mr. Gates backed by a local group, the John Trentacosta Trio, which included the drummer John Trentacosta, the bassist Michael Olivola and the keyboard artist Brian Bennett. Mr. Gates is a tall, gangly man with large, strangely comforting features that give you a glimpse into a life that wasn't always spent singing in front of sophisticated admirers in posh settings. By his own admission, he has spent years running bulldozers and doing other construction related jobs-at one time running off to find adventure in the wilds of Alaska during the construction of the pipeline in the mid-seventies. With a traditional upbringing that stressed a love of music as an avocation but never as a profession, it is to his credit that he was able to eventually follow his heart and let his unique vocal talents flourish to the benefit of all. With a warm, distinctive baritone voice that has the deep coffee tones of a dark roast, he is as disarming a troubadour as they come. His set featured many songs from his latest release Luminosity . His delivery is smooth, confident and conversational with no traces of arrogance. He is an endearing storyteller, as was on display by his tongue-in-cheek take on the old standard "Pennies from Heaven". Mr. Gates cleverly portrays a cuckolded soldier who returns from a three year stint in the service only to find his wife presenting him with a newborn son. Her explanation "Bennie's from Heaven". His silky baritone is particularly adept at ballads like his slow, sensual take on "You Go To My Head" or his hip rendering of the Gershwin classic "Summertime". Like one of his influences, the late Eddie Jefferson, he is a master of the art of vocalese and scatting , studying instrumentalist solos from the likes of Chet Baker (on "But Not For Me" ) and Charlie Parker (on "Lady Be Good" ), precisely duplicating them with his voice in all their labyrinthine complexities. Several times during the set he vocally mimicked instrument sounds. He voiced solos on bass, trombone and flute much to the surprise of the audience as well as the amusement of his band members- the highlight being his trombone solo on Cole Porter's "You'd Be So Nice to Come Home To". 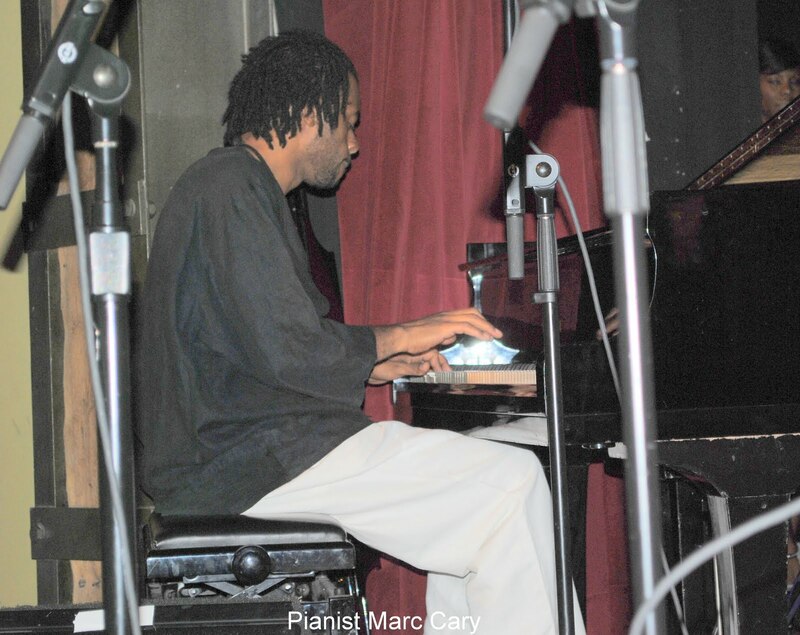 He was equally adept at taking the bossa sound of Horace Silver's "Song for My Father" , a especially relevant song on this Father's Day, and inserting percussive accents making it his own. of the bassist Michael Olivola who was particularly sympathetic on the duet " But Not For Me". the program with the ease of an accomplished conductor. Mr. Gates is a true treasure that should not be missed in "live" performance, where his warm personality adds another endearing element to his considerable vocal talents. His performance at La Posada was a tour de force and was undoubtedly the jewel of the season for the Friends of Santa Fe Jazz 2010 concert series. 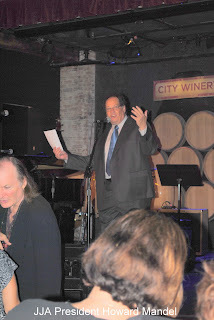 Last night I attended the 2010 Jazz Journalist Association Awards ceremony at the City Winery in lower Manhattan. The event was a joyful meeting of the jazz community, bringing together the musicians, publicists, record producers, journalists, broadcasters and educators who all in some way symbiotically allow this art form to flourish. Jazz, as a musical genre, is as diverse as the community it serves. 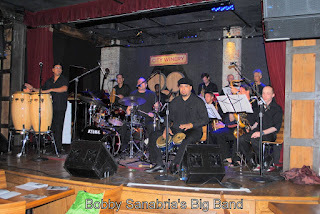 The performers that graced the stage of the City Winery, as well as the award recipients were emblematic of this wonderfully unifying reality. The event would have been impossible without the dedicated work of JJA president Howard Mandell and several supporting members including the tireless efforts of event co-producer Yvonne Ervin. hors d'oeuvres by the venue's gracious host Michael Dorf, owner of the City Winery. The performances were somewhat overshadowed by the bustle of the normally savvy and discerning crowd. With so many heroes, contemporaries, fellow artisans and fellow writers in the attendance, it was just too difficult for many of the attendees to quietly focus on the music. People milled around, meeting, greeting and mingling in a rare chance to connect. The ceremony was simulcast live, with streaming broadcasts to parties that were organized in other satellite cities. The performers valiantly carried on, oblivious to the ambient buzz. The internationalism of the music ranged from the thoughtful solo styling of Japanese pianist Ayaho Shirasaki, to the deceptively easy listening sounds of the Serbian guitarist Rale Micic, with his Balkan folk music infused jazz trio. 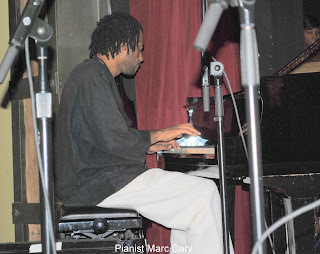 The home grown sounds of DC born Marc Cary's Focus Trio played with an intensity that had many in the audience mesmerized. Colorado born saxophonist Tia Fuller , a member of Beyonce's all female band, headed her own Quartet with the alto saxophonist showing her prowess on the horn. 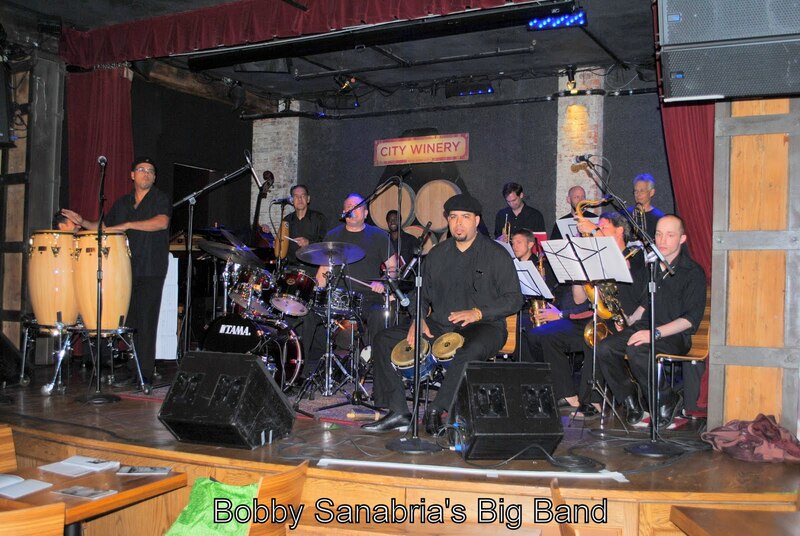 Bobby Sanabria's grammy nominated Big Band ended the evening's music with a smokin' set of Latin-infused big band music that got everyone's feet tapping. I won't go into listing all the nominees and the winners of the awards as they can be found in a beautifully succinct and organized fashion at JazzTimes here . Some of the highlights of the evening were Darcy James Argue's two awards for "Best Up and Coming Artist" of the year and "Best Large Ensemble of the Year" for his incredible "Secret Societies" debut album "Infernal Machines" . 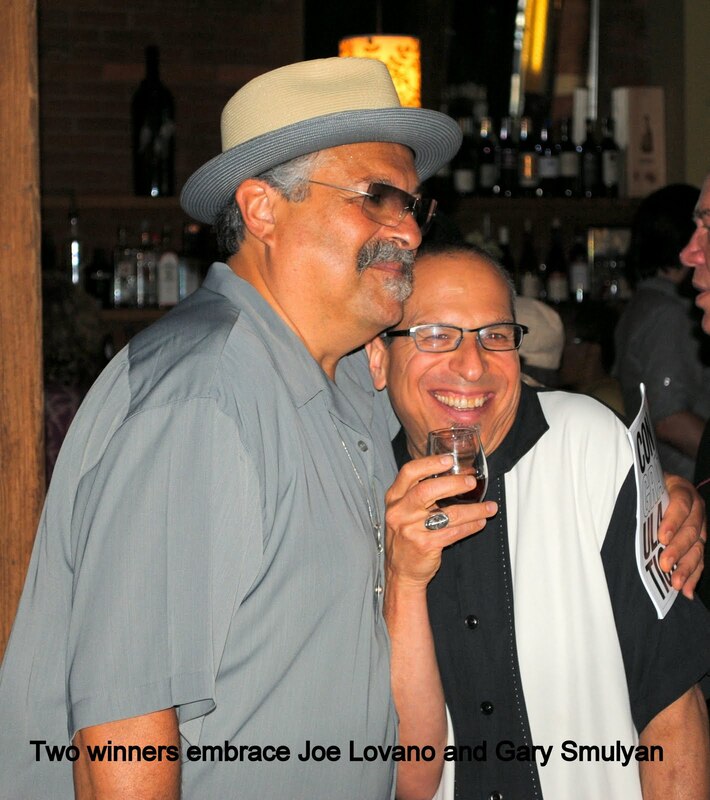 Despite a traumatic year in which he freakishly broke his arm twice, Joe Lovano won three awards- one for "Tenor Saxophonist of the Year", one for "Best Small Ensemble of the Year" with his "Us Five" group and the prestigious "Record of the Year" award for his brilliant "Folk Art" . In deference to a solid body of work, the saxophonist James Moody was honored with the "Lifetime Achievement" award, but was unable to attend due to recent surgery. The audience was sprinkled with plenty of other jazz veterans including past award winner altoist Lee Konitz, saxophonist Lew Tabakin, chanteuse Sheila Jordan, saxophonist Jimmy Heath, producer of the year George Wein, trombonist of the year Roswell Rudd and this year's award winner for best organist Dr. Lonnie Smith along with other journeymen musicians and writers. 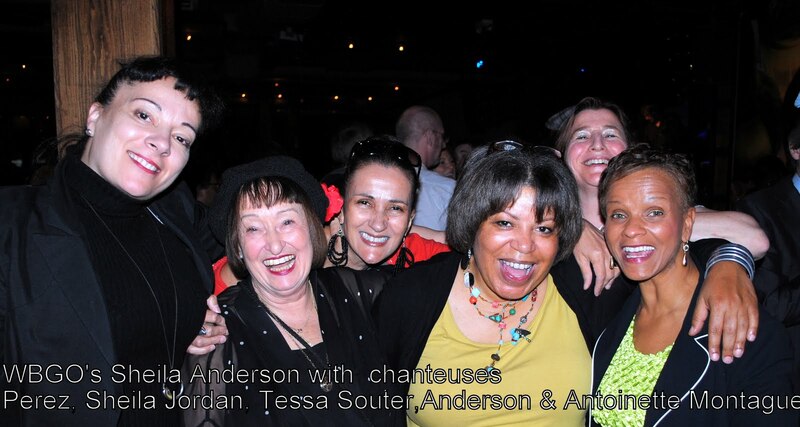 Youth was also in abundance at this years awards ceremony, a sign of a bright and vital future for this music. "Musician of the Year" pianist Vjay Iyer, "Alto Saxophonist of the Year" Rudresh Mahanthappa, "Up and Coming Artist of the Year" composer/ arranger Darcy James Argue, mallet master award winner Stefon Harris and drummer extraordinaire Matt Wilson were all in attendance. I came unaccompanied to the event, but with all the love in the room, a love generated from a love of this music, I wound up having a great time sharing a table with two wonderful singers, female vocalist Perez and male vocalist and award nominee Giacomo Gates. Also seated at my table were two other nominees, the dynamic baritone saxophonist Claire Daly and talented flautist/composer Jamie Baum. In keeping with the international flavor of the event the "Jazz Picture of the Year" was awarded to a black and white shot of the trumpeter Tom Harrell, set against a huge curtain by Russian photog Lena Adasheva. Click to here to view. Fellow blogger Doug Ramsey won best "Blog of the Year" for Rifftides, congratulations to Doug. It was a great time of celebration. The outpouring of love and camaraderie that this community has is both heart warming and inspiring. The JJA should be applauded for creating and fostering this forum of recognition and celebration. Despite the harsh economic realities of the music business in particular and the economy in general, I came away with a renewed spirit of hopefulness. Hopefulness that this music is the key to a communication that fosters tolerance, inclusion and spirituality and needs no translation. Hopefulness that this music transcends nationalistic borders, cultural differences and is immune to totalitarian restrictions. This year, with many awards going to younger artists who have an ever expanding creative vision of the future of jazz music, I have come to believe that we are on the dawn of a new era for this music. Bandwidth is the highway to global interactivity and cooperation. It recognizes no boundaries, proving to be both pervasive and resilient to attempts at censorship . Music, and in particular jazz music, is the universal interpreter of the cooperative message of love. From the opening notes of this unusual cd you know that you are in for something a little different. The playful nature of Greg Pattillo’s breathy flute sound is at once intriguing, entertaining and totally different from any sound that you maybe expecting or have probably ever heard. Pattillo is perhaps best known as a practitioner par excellence of a technique known as “beat box” flute playing. “Beat Boxing” is the practice of using your mouth to create drum sounds and is an important part of the rap music genre. Pattillo, although not the first to incorporate this technique into flute playing, is certainly one of its most accomplished artists. A You Tube video featuring him playing “Inspector Gadget” at has gone viral, reportedly receiving over 21 million views! He has taken his classical training on flute, along with formidable chops and added the rhythmic element of “beat boxing” to his repertoire extending the sonic palette of the flute. His fellow and equally talented trio members Eric Stephenson on cello and Peter Seymour on bass (both classically trained musicians who have been members of major symphonies in their own right) combine to form Project Trio, a genre blending chamber music group that blurs the lines between classical, jazz and various contemporary and alternative music forms. Now based in Brooklyn- the epicenter of modern music-under the moniker of Project Trio, the three have released a new album of the same name that deserves serious attention. The raucous “Dr Nick" is a memorable repeating melody, reminiscent of early Jethro Tull. The beat is made all the more alive, combining multiple rhythmic elements including Pattillo’s “box beat” flute and percussive playing on the bodies of their instruments by Seymour and Stephenson, all deftly intertwined with pizzicato and bowed string parts to create a joyous musical experience. The Trio has a conversational sensibility that crosses into instrumental folk music with a playful storytelling motif especially on tunes like “Dup Dup”. “Fast” is a skillful exercise in each musician’s dexterity. Their more straight ahead treatment of Dave Brubeck’s “Blue Rondo A la Turk” , from the classic album "Time Out" is an interesting and faithful take on a piece of music that was one of a signpost for classically influenced jazz. “City of Dreams”, a poetic take on Brooklyn, is the only vocalized song on the album. It may well be a bow to the alternative rock of the early 90’s band Soul Coughing. Mark Gurarie’s vocal, a stream of consciousness poem-like rant, seems inspired by the band’s Mike Doughty to my ears. “Visual Machine” is a sonic delight with Stephenson and Seymour combining to weave wonderfully evocative arco duets behind Pattillo’s repeating rhythmic flute patterns. Pattillo’s flute at times has an almost aboriginal sound to it. He is capable of eliciting sounds that range from the most softly sublime, almost spiritual whispers to the most slashing howls. “Grass” is a cross into bluegrass territory, with an oompah bass line from Seymour and a fiddle-like, hoe-down quality emanating from Stephenson’s cello that gets your feet stomping. Great fun. “Arco/Pizz” is a reference to the bowing and picking techniques used in string instruments and both are used in this solemn piece, which most closely resembles true chamber music. The final song is remake of a “Guns ‘n Roses” composition titled “Sweet Child O’ Mine" which will undoubtedly afford the group greater accessibility to a wider, more popular music oriented audience who can identify with the familiar melody of this song. It is nice to see a group of talented musicians create a music that blurs lines between classical chamber, jazz and alternative popular music so successfully. Creating bridges by using their unique vision, their formidable skills while maintaining an unbridled joy that is infectious and has mass appeal. Project Trio in a jazz vein plays Charles Mingus's "Fables of Faubus"